US, 1932, 72 minutes, black and white. William Haines, Madge Evans, Anita Page, Karen Morley, Neil Hamilton, Wallace Ford, Jean Hersholt, Joan Marsh. Are You Listening? is a drama set in the early days of popular radio. 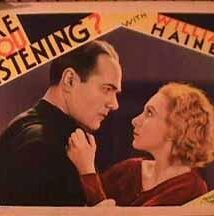 It is definitely a pre-Code film, with the central character involved in a relationship outside his marriage, wanting a divorce, but married to a demanding woman who refuses to let him go. In the middle of the film, he has an argument with her, pushing her away and her hitting some furniture and dying. He becomes confused, goes to see his mistress, escapes from New York with her, travelling by car to Florida. The girlfriend, a really pleasant young woman, works at the radio station as does her younger sister as a receptionist – but who prefers the all-night clubbing life. The youngest sister also comes to town and both are concerned at the death and the escape of the couple. One of the main themes is that the newspaper in New York which has a relationship with the radio decides to collaborate with the police. The difficulty is that the editor, Neil Hamilton, is an exploiter and his sensational words on the radio are extremely prejudiced and judgemental. An editor in Florida contacts New York so that both the voices are heard, edited, on the radio, especially with the girlfriend pleading innocence. New York exploits this and police come, both couples are arrested, the girl set free, and goes to see a lawyer, while the man sentenced to 3 years for manslaughter and manfully goes to jail, hoping for remission of time for good conduct. The film was directed by Harry Beaumont, a director from silent times and director of the Oscar winning Broadway Melody as well as several of the Maisie series.